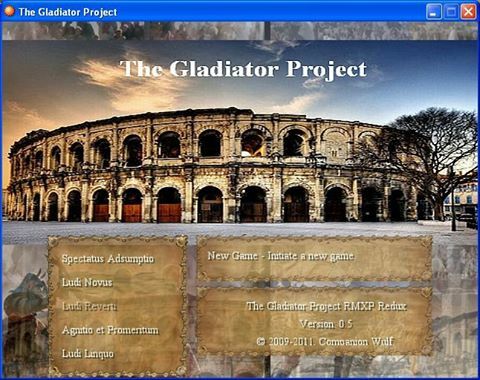 The Gladiator Project was first developed for RMXP, based on its original hack-and-slash concept for RM2K3, but highly expanded. It then migrated to RMVX, where further expansion took place (including customized graphics). To begin with, I wasn’t very competent at RGSS and frequently lurked in forums to try and learn from others’ scripts. I’ve been thinking about redeveloping this for RPG Maker MV, perhaps as my next project after Otherworld SGB: Through the Veil. However, this may not happen anytime soon, tentatively this year, more likely next year. I would most likely rename the project and re-conceptualize certain areas. And use higher quality, high definition graphics as well. If the addition of movies is an option, they too would be hi-def. The Gladiator Project as a whole is something I’ve wanted to work on for a long time. If redevelopment was an option, the storyline and content would remain the same, but the artwork and many of its concepts would change. I wrote numerous short stories set in the same world as The Gladiator Project. Unfortunately, I no longer have most of these. That said, I still remember all of them and may rewrite them at a later date. And if that’s the case, something to consider is releasing them to coincide with the game’s release. As far as its actual redevelopment, only time will tell. ← A Frustrated Roar from Tryggr!